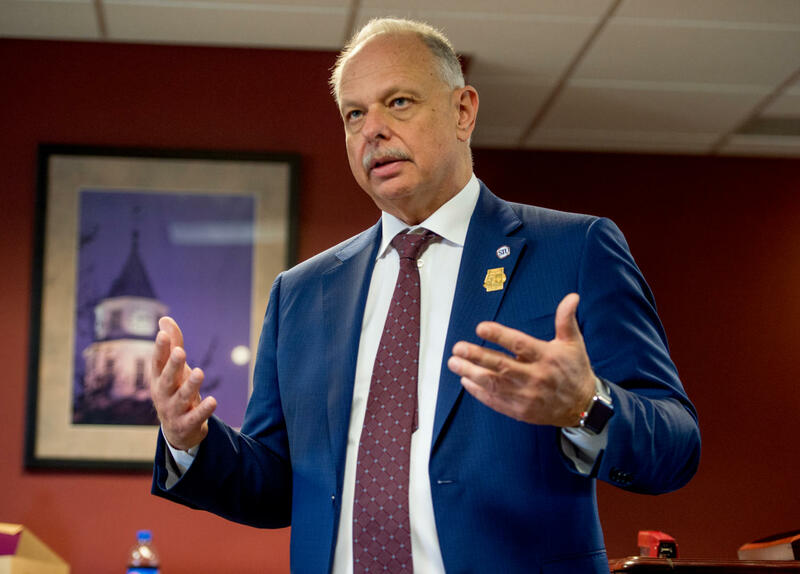 Out of the faculty who voted, 75 percent chose to extend the deadlines for reviewing or not advancing SIU Chancellor Carlo Montemagno’s restructuring plan, according to a press release from the Illinois Education Association’s regional office and the Faculty Association. Faculty Association President Dave Johnson said this statistic represents the votes cast so far. The Faculty Association continues to mislead the campus community by the misrepresentation of information, Montemagno said in his his blog post “Embracing Accuracy” posted on March 27. Johnson said he thinks faculty who voted to slow the reorganization process down or opposed it did so because they believe the chancellor’s proposal is not in the best interest of their programs and students. “The number one thing people are concerned about, which has been true since the beginning of this process, is the elimination of academic departments,” Johnson said. Montemagno said the release of the statistics is a disservice to anyone who values the university’s future. “I believe that these votes for extension reflect the considerable confusion among faculty surrounding the larger reorganization, as well as resistance to the chancellor’s initial timetable, which was always unrealistic,” Natasha Zaretsky, a member of Faculty Association and Coordinating Committee for Change said. The Faculty Association responded in a press release to the chancellor’s blog with a rejection that the voting statistics were inaccurate and sharing the results of faculty votes does a disservice to SIUC. The release included a straw poll statistic, that was taken by various departments based on the merits of the chancellor’s plan, according to the the Faculty Association. 79 percent of faculty who voted in the poll voted against the chancellor’s proposal in their area, including overwhelming margins of votes cast in the proposed schools of Engineering, Physical Science and Humanities, according to the release. Montemagno responded in his blog and said straw polls are a normal part of the negotiation process among faculty to assess where they are starting from. The Faculty Association responded to the blog by saying straw polls serve only to allow faculty to negotiate with one another. “The 111 faculty who voted to oppose the chancellor’s plan in their area (as opposed to the 30 who voted in favor) were sending a message to the chancellor, whether he wants to hear it or not,” the Faculty Association said in the press release. In this straw poll statistic, 141 faculty members voted in total. The Faculty Association said the chancellor contradicts himself by trying to find support in the “many” positive votes in straw polls. The Faculty Association said the chancellor stands by his claim that feedback on his plan has been positive, but has yet to provide the evidence necessary to support his assessment. Faculty Association said that the chancellor is contradicted by public votes by the Faculty Senate, Graduate Council, Graduate Student Professional Council, and Undergraduate Student Government, the Coordinating Committee for Change survey results, and now by the compilation of votes in the press release. In his blog post, Montemagno said one of the statistics referenced in the press release was distributed selectively. “Based on the comments of a number of individuals, including faculty, it appears that the referenced survey by the Coordinating Committee for Change was distributed selectively; many have indicated that they were never aware of it,” Montemagno said in his blog. The survey included responses from 246 faculty both non-tenure track and tenure track faculty and showed that 39 percent of faculty supported the chancellor’s plan. “Overall, only 36 percent of the more than 1000 people to fill out the survey voiced support for the chancellor’s plan. The CCC survey also found 62 percent of faculty opposed the elimination of departments and chairs,” the Faculty Association press release said. Faculty Association went on to explain that the CCC group publicized its survey via press coverage and Facebook advertising which was directed at all Facebook users in the Carbondale region. The survey was open to anyone with an internet connection and that the group has been transparent about its methods and results, the Faculty Association said. “While some faculty may support the reorganization and others may simply want more time to review it, the cumulative evidence of votes, combined with the CCC’s survey data, makes clear that the chancellor does not have the buy-in that he needs for the plan to succeed, at least in its current incarnation.” Zaretsky said. The press release also discussed Montemagno’s progress with reorganization, specifically dealing with the April 12th Board of Trustees meeting. Montemagno responded in his blog saying while his goal was to have a finalized plan by the Board of Trustees meeting in April, it was always dependent upon the speed with which faculty reviewed and responded to proposals. The Faculty Association said the chancellor blames the delay in finalizing plans on faculty taking time to review and respond to proposals. Faculty Association said faculty have not been sitting on these plans for the last six weeks but really they have been stuck in Anthony Hall. They said this is because the chancellor has tried to force through more changes than his own staff can process. Additionally, they said Montemagno shifted to proposing college RME’s, a process which they said has now been indefinitely extended. The chancellor and the president should resign, immediately! SIUC is in rapid decline, it appears.